Aaah Japan. Home of anime, fashionable teens, martial art and geishas. And of course the food: sushi, fragrant miso soup, chewy udon noodles, pretty-in-pink pickled ginger, sticky rice and tofu. And even though I love all of the above (miiiiiiiissssoooo), I can see how it can be slightly intimadating for the average, slightly unadventurous Westerner. After all, raw fish and fermented bean curd isn't quite in our frame of reference. We tend to focus more on hamburgers, hotdogs and pizza. You know, the more substantial things in life. Enter tempura. Who doesn't love a crunchy deep fried morsel? I get giddy just thinking about the deep fried goodness that is KFC. Although the typical heavy, greasy taste tends to get to me pretty fast. Not so with tempura. It features a light, delicate texture that perfectly showcases the freshness of the vegetable being used. Now, on principle, I don't deep fry foods simply because of the fuss involved. I just can't be bothered to heat up a truck load of oil, deal with the splattering and sputtering and devise some method of oil drainage afterwards. Especially as usually it's just not worth it. But if you're talking tempura, I can be persuaded to set my prejudice aside for a few minutes. Oh yes I can and I did. The nice thing about it is that the batter takes about 30 seconds to make and then fries up super fast. It's literally a matter of seconds and not minutes before the batter is cooked. Which removes quite a bit of the usual deep frying hassle as you only have to deal with it for perhaps 10 minutes tops, which includes frying all your batches and then re-crisping them one last time before serving. Served with a sprinkling of seasalt or a flavourful dipping sauce, tempura is definitely one of life's simple pleasures. Sharing is optional though. In fact, I didn't. What? TheHusband wasn't home. You snooze, you lose. I am submitting this to the barrel of laughs that is Joanne of Eats Well with Others, who hosts Regional Recipes. September's chosen country is Japan and entries can be submitted until the end of the month. 1. Gently mix egg, water and flour together in a bowl, using a fork. Be careful not to overmix else the gluten will be activated and the finished tempura will not have the correct appearance or texture. In fact, you can err on the side of undermixing with still a few clumps in the batter, to give that typical knobbly look to the tempura. 2. Fill pot several inches deep with oil and heat on the highest setting. Use a piece of bread to test whether the temperature is correct - if it starts to sizzle when you put it in, the oil is hot enough. 3. Meanwhile, cut your veggies into bite sized pieces. When the oil is hot enough, coat the vegetables with the batter and immediately drop into the hot oil. This should be done in batches, so as not to overcrowd the pot and drop the temperature of the oil too much. The tempura will only take a few seconds to cook, after which it can be removed with a slotted spoon and drained on paper towels. Serve immediately, while still crisp and warm, with a dipping sauce made of soy sauce, sugar and mirin. Although, it would be equally delightful (if slightly unorthodox) if served with sri-racha. *The batter is sufficient for quite a lot of vegetables, so be prepared to make quite a few batches. 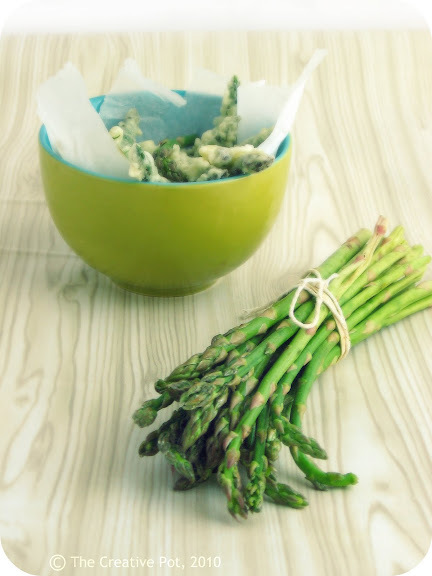 I fried two bunches of asparagus (like the one in the photo) and still had some leftover batter. It can be kept overnight in the fridge at a push, although the consistency changes slightly. It's very important that the water is ice cold to produce that delicate tempura structure. If you are making large quantities of tempura at the same time, slightly undercook the first few batches and then return to the oil to crisp up again just before serving. I've found this also helps keep the tempura crisp for much longer. This is brilliant. Fantastic photography!!! By strange coincidence I just happen to have a fryer at home at the moment and was toying with the idea of making some tempura for dinner. Well, you've pretty much convinced me! Butternut squash and aubergine tempura it is. I like the idea of having a slightly alternative dipping sauce with some chili in it. I love how versatile this is - you can basically use any veggies you like! Um... neighbourhood plundered tree berries? :-) They're not edible I think. Just looked pretty. Ah-ha, hence the tweets about Japanese food. Love Japanese food and love tempura! Love your colour and styling, as always! And man, how did you find that old post of mine today? hahaha! Thanks for your comment and for popping in Marisa x! 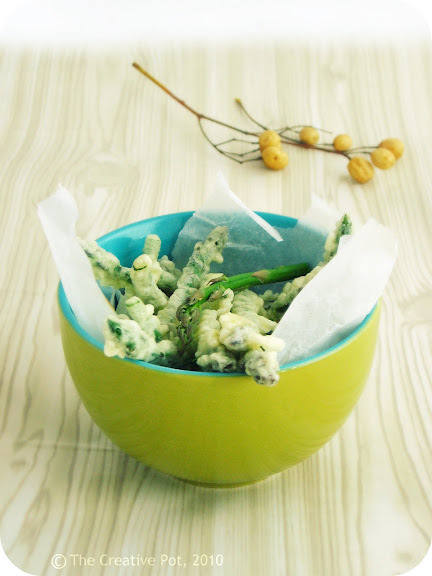 I love tempura - this looks wonderful and easy. When I visit your site the first thing I always notice is the great photos. 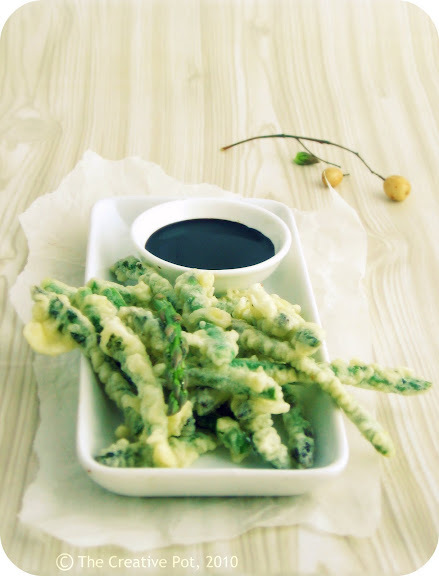 The Tempura looks great, but then again, I am crazy about anything that contains fresh asparagus. I've never made tempura, but it's something I love to eat out! I also love it's lightness. I'll have to try this at home. Ahh tempura! One of the few deep fried foods that I'll actually eat. I've always wondered how you get it to taste so light...unlike most fried food. Guess I'll have to find out and try this recipe! Thanks so much for sending it to Regional Recipes! Thanks Arnold! That really puts a smile on my dial. Ohhh I'm hungry now! So pleased to have found your beautiful blog, the photos are just gorgeous. Wow, I love tempura, but maybe because it comes from Portugal and it's a very Mediterranean way of cooking, perfected by the Japanese. I'm afraid I'm one of those unadventurous Westerners ;), even though I rave about Indian cooking, for example. I love making tempura everything! It's so easy and adds such an extra special touch to just about anything. This asparagus looks awesome and the great thing is that we can use the same method for just about any veggie as you said. Marisa! So sorry about that! I think that the submission got lost in my email. It is now posted though! Hope the unpacking and settling into the new home is going well!